Central apartment close the SEA . "MERGELLINA"
The flat is located in the district of Mergellina , one of the most beautiful areas of the city. Throughout the area there are many bars and pizzerias. The taxi rank is a few metres away. The apartment was completely renovated in May 2012, and are located on the first floor of a *building with concierge service and lift . The master bedroom is situated on a loft area with a staircase for access, with a large wardrobe. The bathroom has been completely refurbished including a shower with massage jets. All inclusive ( gas, electricity,air conditioned, bed linen,towels, kitchen, internet etc. The apartment (Bianca) is about 60 square metres, and consists of two large rooms ; one a double bedrooms and the other the living room with a well-equipped kitchen area. The sofa also converts into a double bed, so it can sleep a total of four people. It 'a house of the beginning of the twentieth century, only 100 meters from the waterfront promenade. it's uniqueness lies in the beauty of the area where it is located, central and at the same time quiet and well attended. We absolutely loved Mario’s apartment in Naples (Mergelina)! It is in a super building in a super location. It is very easy for visiting the entire Naples area. It is super comfortable and well appointed. The air conditioning and window screens to keep out the dreaded mosquitos were outstanding. It made the time very, very enjoyable. Mario is a super owner who was extremely responsive and very helpful. We cannot recommendMario’s apartment enough. We will definitely return!! The apartment was very clean, Chiara was wonderful, she waited for us as the traffic was horrible, she helped us carrying our luggage as we’re an older couple. She brought us to the parking garage, she met us again when we left . We stayed in the Bianca apartment in the Margellina neighborhood and loved it. The place is roomy with useful small kitchen, high ceilings, roomy bedroom and comfortable beds. It is close to a Metro line (#2,#6) and buses, less then a block from the sea and the promenade and in a safe, clean and friendly neighborhood. Many small shops and services, restaurants and bars. The apartment has a washing machine (very handy) and an elevator. In short it is a great one for short or long stay. we want our guests to feel at home, so we strive to make their stay without problems. The apartment was fantastic. It is a great size and gave us plenty of room. It is well appointed and we had everything we needed for the kitchen. It made our time there very easy and enjoyable. 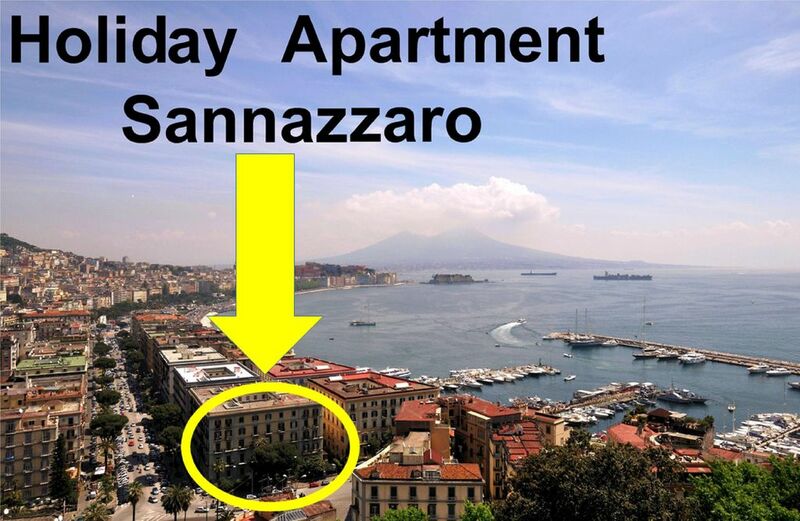 The location is perfect for exploring Naples and the area. We very highly recommend the apartment and will definitely return! We treat our guests as family members. Let's try to meet their needs. This was an amazing apartment in Mergillina, not too far from downtown Naples. The apartment is big, bright, well equipped and very clean. By car take the motorway ( Tangenziale of Naples) exit at Fuorigrotta continue for Mergellina.